SHOWS: MELBOURNE, AUSTRALIA (NOVEMBER 6, 2018) (DOMINIQUE CURCHOD COMMUNICATIONS - Broadcasters: NO ARCHIVE. NO RESALE Digital: NO ARCHIVE. CROSS COUNTER BEATS MARMELO TO THE FINISH LINE 4. JOCKEY KERRIN MCEVOY AND CROSS COUNTER AFTER THE RACE 5. SLOW MOTION REPLAY OF RACE FINISH 6. MCEVOY CELEBRATING STORY: British stayer Cross Counter won the 158th running of the Melbourne Cup on Tuesday (November 6), handing the powerful Godolphin stable a first win in Australia's most famous horse race after 20 years of frustration. The Charlie Appleby-trained gelding stormed down the straight from the outside to haul in runner-up and last year's favourite Marmelo by a length, with A Prince of Arran third in the A$7.3 million ($5.26 million) handicap. Jockey Kerrin McEvoy celebrated his third win in the gruelling two-mile race, drawing level with active jockeys Damien Oliver and Glen Boss. Only Bobby Lewis and Harry White have won more with four victories apiece. 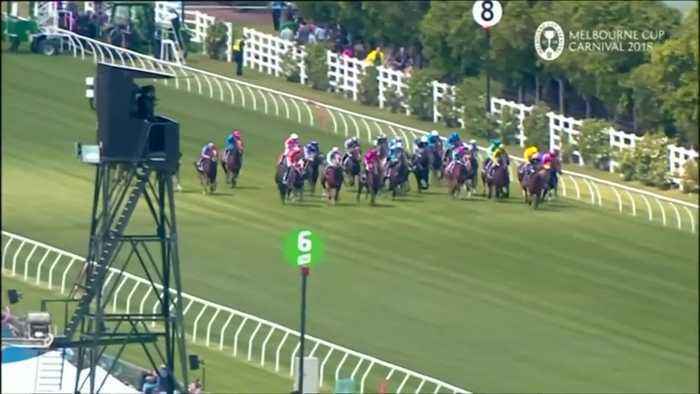 It was a relief for McEvoy, who was blocked when Aidan O'Brien-trained The Cliffsofmoher pulled up lame early and was later put down on the track to add a sombre note to the celebrations at Flemington racecourse. Four year old Cross Counter is the first British-prepared horse to gallop off with the world's richest two-mile handicap. McEvoy's win on the 9-1 shot followed his Melbourne Cup triumphs on Almandin in 2016 and Brew in 2000. Godolphin's owner, Dubai ruler Sheikh Mohammed bin Rashid al-Maktoum, had spent a fortune sending horses to the "race that stops a nation" over two decades and now tastes victory after linking up with Newmarket trainer Appleby. Favourite Yucatan, prepared by O'Brien, finished 11th, with the Irishman's other entrant Rostropovich fifth in a disappointing race for the master trainer. Torrential rain pelted down on Melbourne in the morning, causing chaos at the racecourse where train-loads of spectators were held up from alighting at the nearby station. But the weather cleared after midday, buoying a festive crowd and drying out the track from heavy to soft an hour before the race. Saddled with 51kg, the equallest lowest burden with Rostropovich, Cross Counter had work to do entering the final turn after jumping wide from barrier 19. But he bolted home with energy to spare as a grinning McEvoy rose from his saddle. Godolphin's other entrants Best Solution, winner of the prestigious Caulfield Cup in the leadup, and Avilius finished eighth and 22nd respectively. Chris Waller-trained Finche came in fourth to be the best of the locally prepared horses, while Japanese entrant Chestnut Coat was 14th.